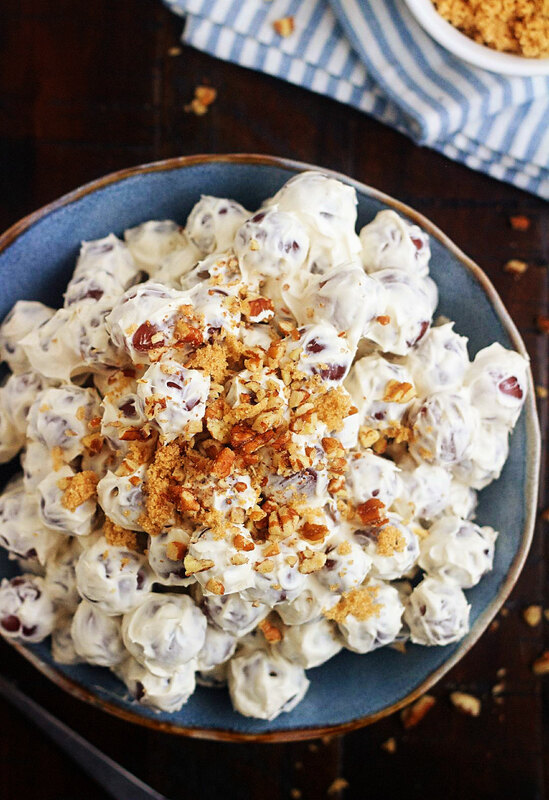 Grapes tossed in a sweet cream cheese dressing, then sprinkled with brown sugar and pecans. This Grape Salad will instantly become a favorite! Sorry for the not getting a post up on Monday. I’m really trying not to go MIA with all that’s going on right now, but Monday was one of those days where I had really good intentions of posting, but it just didn’t happen. Maybe I was too exhausted from my 30-year reunion. I got home about midnight, and for us old folks, that’s way past our bedtime (lol!). But seriously, it was an absolute blast. It was so much fun seeing friends I haven’t seen for years. I may be a little biased, but my graduating class was a pretty spectacular group of people. I feel really blessed to know them and even all these years later still consider them my friends. Ok, enough of the sentimental stuff, let’s get back to food. Today I’m sharing this amazing Grape Salad. My mom got this recipe several years ago from a friend and I fell in love with it the first time I tasted it. I shared the recipe over at my cute blogging friend Holly’s site, Life in the Lofthouse. I love all of her recipes and I’m so lucky to be a contributor on her site. So hop over for the full recipe.